Before starting the preview I want to say sorry for the Imadaev bet, I know some of you followed me and we had bad luck on this one, referee took one point at first minutes of the fight which means that Imadaev had to win all the 3 rounds to win the fight or if he wins 2 rounds out of 3 it's a draw. 1 judge give it a draw and 2 others give the victory to Griffin. Very very close fight but Imadaev just fought with 0 fight IQ, throwing spinning back kicks and elbows, Griffin took him down every time he threw something like this and that's how he won the fight. Imadaev's lack of high level experience was seen that night. He fought like he was on regional circuit not as he was in UFC. Honestly Crawford is very good boxer, unified champion at super lightweight, this achievement can't be over seen but making him number one pound for pound is honestly too much. Ok he was unified champion, he won belt in multiple weight class, but when you look at him boxing wise he is very beatable. Khan is former world champion, fought in different weight class, fought below welter, fought at super-welter too, now this fight is at welterweight which I think is a good weight for him. Even fighting against Crawford at this weight is good for him because Khan is used too to fight bigger boxer for years now. 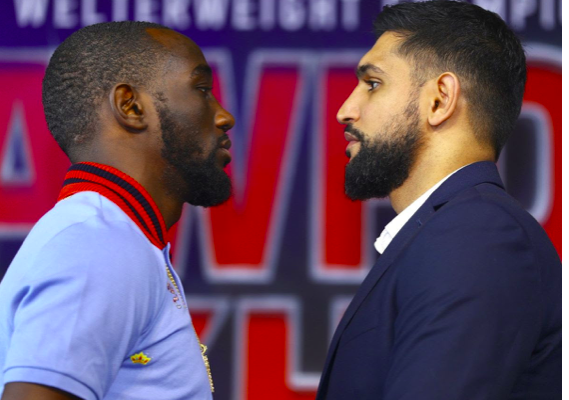 Khan is not big for a welterweight but so is Crawford. A lot of people are making of fun of Khan, saying he has not chin he is going to sleep blablablaa. Ok but now look at who he took the KO honestly, Alvarez was way bigger and was at super welter weight, Danny Garcia has that knock out punch and was bigger too. Now it's true that Khan recently been knock down by Samuel Vargas who is not honestly an elite fighter, but he managed to get back on his feet and winning the fight after. So In this fight honestly I dont think Crawford will just come in the ring, knock out Amir Khan in 6 rounds and go home like some think. Like I said Crawford don't have that knock out power, is coming from weight below, and he is not a fast starter. Most of his stoppage came after round 6 and it was against lighter opponents. Bro what do you think about Overeem via TKO/KO/Sub? Pure win is 1.40 so a stoppage should be around 1.80-2.00 once the line opens in bet365. Obviously he can`t be trusted because of his chin but his opponent is a quick replacement and he can`t be in such a good form as Reem. Also card location is against Reem so that`s another reason for those odds but imho he`s really well prepared and a stoppage could give him another high profile fight instead of a decision. And I was thinking about this 3 piece with a soda combo for pure wins, Overeem 1.40, Shevchenko`s sister 1.28 and Sergi Pavlovich 1.33 @ 2.39 as a treble in bet365 for med-high stakes. Very well said about Overeem, those were my doubts too. I will take your combo for med-high and switch my reem combo to lesser stakes but I`m still gonna try it. By the way, Tony apparently is suggesting on twitter that he`s fighting Conor next and that UFC offered him that fight, that would be fun if true of course.